Contemplating how to remove a large tree stump properly – or if at all – depends on how motivated you are with an ugly stump, and what measures are available in removing it. Aesthetically speaking, landscapes aren’t attractive with stumps, kind of ‘hanging out’. Some may call the leftover tree remnants ‘unsightly‘. However, let’s not move too quickly – you’ll need to have some knowledge of root systems to determine which method works best. 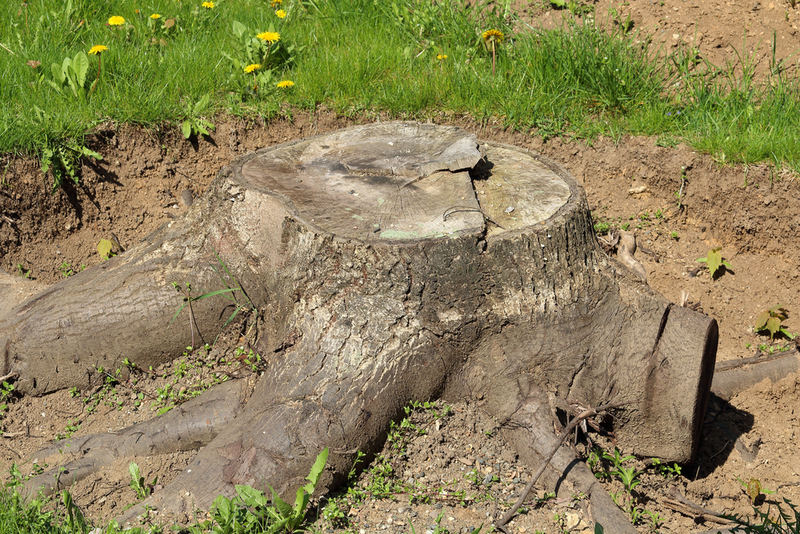 Once you’ve determined tree type and work involved with removal, check out methods commonly used to remove tree stumps, then determine if you’ll throw in the towel and hiring tree stump removal would simply make sense. If you know how to remove a tree stump by hand, you probably know that tremendous physical labor is involved too. You’ll need to dig around the root, of course, then cut the root out with either a chain saw, band saw or yank it out with a backhoe. They do make band saws, too, because they’re sharper than regular saw blades. Not always will stump removal by hand will work. 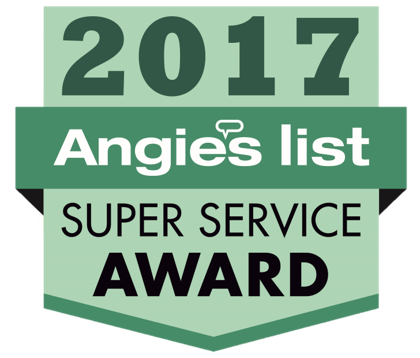 It’s physically demanding labor, can do damage to yards and any piping that runs near stumps, or could cost more than it’s worth. Chemically destroying trees doesn’t happen in hours; 2-4 weeks is optimal before attempting to chop remnants of rotten tree. How does this method work? You’ll start by drilling a series of 6-12 holes evenly spaced through the top of your stump. The longer the bit, the more effective the chemical. Then, you’ll get stump removal chemicals which can be purchased from chain home improvement centers. These are potassium nitrate-based powders which work over time to ‘rot’ your tree. Over a period of 2-3 weeks, check the progress of your chemical. You’ll see bark slowly soften until it’s completely dead. Finally, chop your rotted mass with an axe, then removing the remnants with your shovel. Backfill your hole, and voila – the stump is gone. This chemical is dangerous to ingest, which makes not removing a large tree stump when children are frequently outside, imperative. This method works wonders if you’re into pyromania. Armed with gasoline or your favorite accelerant, matches, and plenty of free time, burn that stump until it’s crispy and until it’s level with the ground. As trees are living beings, the heat will destroy any remaining veins and roots, leaving you with a burnt yard. Cover with dirt and grass, and your mission is complete – except for the fact it takes quite some time to burn, and not always do stumps stay ignited. If you’ve got the time to burn, go ahead and do it. An interesting way people learn how to remove a large tree stump involves rotting. Although it’s identical to chemical stump removal, it’s noteworthy that other chemicals and methods exist to rot your stump, although any chemically-induced tree removal will be dangerous to touch or ingest. Nitrogen-based fertilizers can be filled into holes drilled for chemicals. Except this time, heap some dirt over the holes and water the dirt frequently. This damp environment speeds up the nitrogen’s effectiveness, rotting the tree much quicker than potassium nitrate. A newer, much simpler way to eliminate stumps involves tree stump grinding. With most other methods quite exhausting, stump grinding simplifies the removal process without mess or mayhem. The grinder end looks like an 8-bladed lawn mower, leaving only shavings to remove. The shavings are shoveled away, dirt is backfilled, and voila; the nightmare is over. Timberworks Tree Service offers stump grinding services that get every inch of annoying stump, removed from your yard. Using the modern stump grinders, homeowners that wish to finally eliminate their rotted or otherwise annoying stump can get their stump removed affordably, accurately and with minimal yard mess. 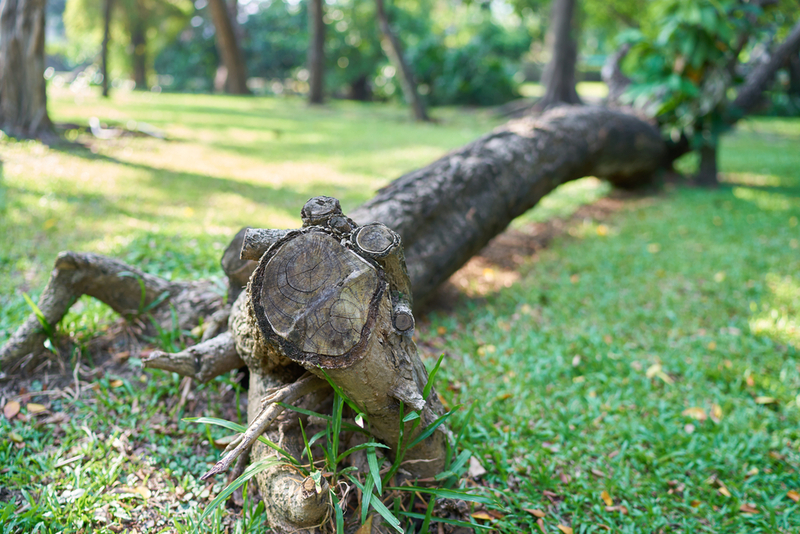 Check our our services when stumps disrupt your lawn’s aesthetic beauty.